I wanted to go there for a while and waited for the perfect Summer day. 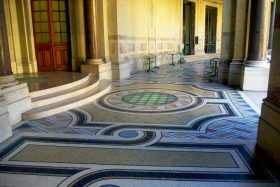 I am talking about the inner outdoor garden of the Petit-Palais in Paris. The relaxing and quiet garden is an oasis of greenery. A surprising place which is little known despite being so close to the busy avenue des Champs-Élysées. 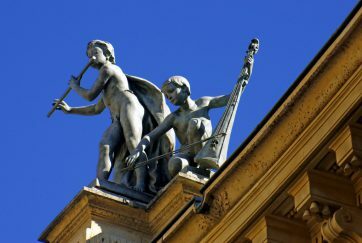 The Petit-Palais houses the fine Arts museum of the City of Paris. 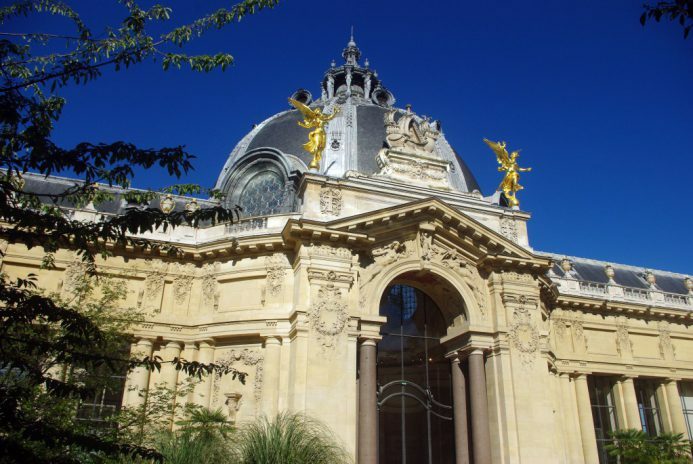 It was built for the 1900 Paris Universal Exhibition opposite its bigger sister: the Grand-Palais. 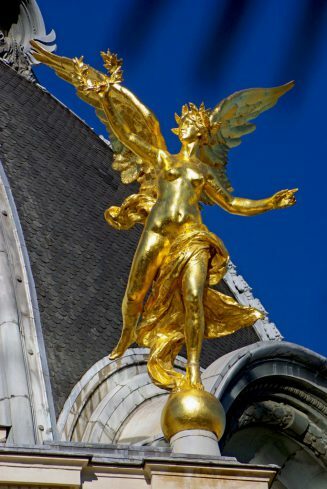 The Petit-Palais is situated in the 8th arrondissement of Paris between the Champs-Élysées and the Pont Alexandre III. The shape of the Petit-Palais makes a semi-circular courtyard at the centre. This outdoor area is occupied by a small garden. The small outdoor garden has pools bordered with blue and gold mosaic. The exotic plants growing there give an expected tropical charm… with a bit of imagination, it seems that we are transported to the French Riviera! 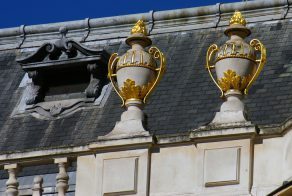 A colonnade elegantly encircles the courtyard with decorative gold swags. It borders the covered gallery paved with swirling mosaics. 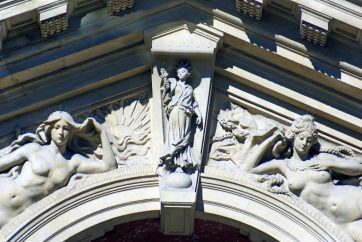 Notice the gallery’s ceiling decorated with frescoes. The coupled columns are made of pink granite from the Vosges. 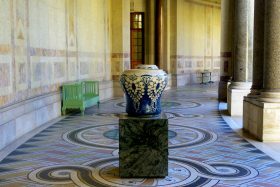 Check out for two huge pots on plinths – they are Sèvres porcelains. 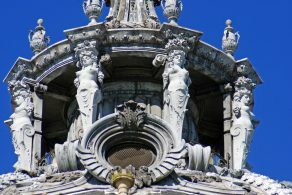 The garden is towered by the beautiful central dome of the Petit-Palais. 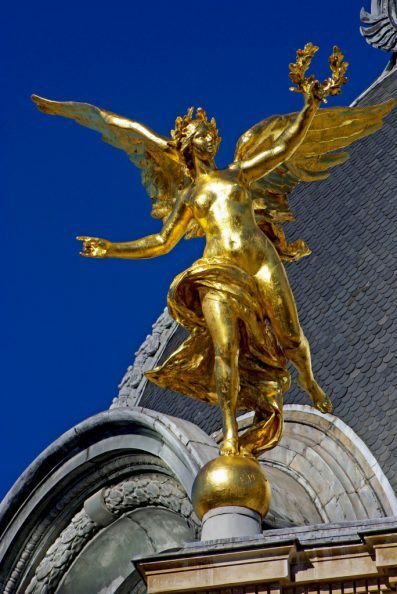 Notice the ship in the centre of the dome: it represents the emblem of Paris. A café serving lunches and gourmet snacks opens onto the enclosed garden. Access to the garden is free. 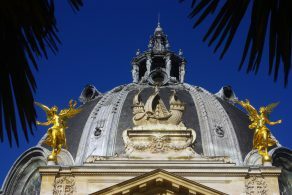 Check out the Petit-Palais website for opening hours. Closes métro station: Clemenceau (lines 1 and 13). Previous ArticleWhy the Canal Saint-Martin is worth discovering?